It's only a matter of time until the NBA revolves around Giannis Antetokounmpo. With two weeks of games under our belts, it's time to dish some takes on what we've seen so far, starting with the Greek Freak's takeover. As of Wednesday, we've had a full two weeks of NBA basketball to process. Here are five takes on what we've seen so far. If you think of superstar athletes like stock, there was a time when Giannis Inc. could've been purchased at a reasonable price. He had potential, definitely, but there were early questions about his jumper, his hoops IQ, and his teammates in Milwaukee. His peers had more pedigree. Even as Antetokounmpo established himself, there were still plenty of good arguments about whether you'd take KAT or Giannis, Brow or Giannis, and so on. Toward the end of last year, Giannis stock was expensive, but nobody considered him the future of the economy. Now that's over. Giannis is Google. Giannis is Amazon. We don't know exactly what the NBA future will look like, but it's pretty clear it will eventually orbit around him. In some ways, we're already there. The numbers so far: 33.7 PPG, 10.3 RPG, 5.3 APG, 1.7 SPG, 1.0 BPG, 63 FG%. Sixty-three! The Bucks fell apart against OKC on Tuesday night, but even in his worst performance of the year, Antetokounmpo finished with 28 points on 9 of 14 shooting. Every other Bucks game, he's played like LeBron at the end of that Pistons playoff series. So yes, today marks two weeks of NBA basketball in 2017-18, and the most important development is that it's now clear Giannis Antetokuonmpo will be the most unstoppable player in basketball within three years. He's already top five, and he's currently the favorite to win MVP. He's like a hybrid of LeBron James and Kevin Garnett, floating somewhere between point guard and center, and making everyone else look kind of hopeless. There are people who wonder how big men will dominate in the small ball era—what would Hakeem Olajuwon look like today? Shaq? Kareem?—and Giannis is the most convincing answer we've seen so far. This is Shaq, with length instead of strength. He's gliding to the rim in two steps, and using an 8-foot wingspan to finish over anyone you put in front of him. Of course, if this is the player we're dealing with, there are dozens of Giannis questions to consider next. Among them: Is Jason Kidd the right coach for him? How much can he really win with a team that's still counting on Tony Snell, Malcolm Brogdon, and Matthew Dellavedova as key members of the supporting cast? Can they flip one of their big men for another wing? How will Jabari Parker fit into the future? If this is what Giannis has become in the regular season, what will Playoff Giannis look like? What kind of cultural impact will there be if the best player in basketball is a Greek immigrant of Nigerian descent? And what does the rest of the NBA look like if the best player on earth is averaging 35 per game without shooting outside eight feet? The answers will become clearer as we go. For now, it's acceptable to be too delirious to think rationally. The only lucid Giannis take I have after two weeks is that I hope he never gets a reliable jumper. Watching him do KD things would be great, sure. But it wouldn't be as entertaining, because it wouldn't be as surreal. Somehow Giannis doesn't need to conform to the rest of the sport to dominate, and that's part of the spectacle. In the shadow of the Warriors and the Rockets and superstars launching threes all over the league, Giannis isn't following. He's working with a blueprint we've never really seen before. This is dangerous. It's reckless. It may look extremely foolish in about three weeks. In fact, if there's anything in this article that makes me feel genuinely self-conscious, it's this opinion. But right now, on Nov. 1, I think the East looks fun. It only took five minutes for the Eastern Conference projections to go up in flames on opening night. Gordon Hayward's injury transformed the Celtics from a Finals contender to a team held together by 20-year-olds. What was supposed to be a top-heavy conference now looks even more underwhelming among the contenders. But there's also another way to read the first few weeks: the bottom of the Eastern Conference is more competent than anyone would've expected, and leveling out the top only makes things more entertaining. So here's where we are: That new Celtics team is already a lot of fun, the Wizards are legitimately good, and the Cavs have one of the three greatest players ever. The Bucks have Giannis and the Raptors have Lowry and DeRozan to go along with a strangely fun second unit. Then there are teams like the Magic coming out of nowhere looking frisky. The Hornets look extremely solid even without Nic Batum. The Pistons are riding Reggie Jackson and Tobias Harris, embracing all the madness that entails. Coming into the year, we approached the East and West like AAA baseball and the Major Leagues. That made sense in July, but in November, I think it's the wrong analogy. What we have here is more like college football and pro football. The West is where every team's weakness is exposed, the story ends badly for almost everyone, and everyone is taking things very seriously. It's dramatic, but I don't how rewarding it is. We nitpick teams and players against the Golden State elite-ness standard, nobody measures up, and fun teams are quickly ground to dust. In the East, though? I'm pretty sure the Nets built their entire team out of Rondae Hollis-Jefferson and Rondae Hollis-Jefferson clones, and it kind of works. The Pacers are making Oladipo look like a Heisman candidate. The Magic are spreading the field for Evan Fournier and Nikola Vucevic and they're in first place, while the Heat are platooning quarterbacks with Goran Dragic and Dion Waiters. The East is where some of these strange experiments can actually succeed and surprise people. The standings could go a dozen different directions over the next six months, and it will be chaos, and it doesn't matter that nobody is beating Bama at the end. The East is college football. And I like college football. Draymond Green screams at referees more than any player I've ever seen. If he gets the occasional technical that looks unfair, there are 50 others that go uncalled. It's a legitimate skill of his, harassing referees far beyond what could be considered reasonable from any other player in the league. And I love Draymond, so none of this is a criticism. But he's not unfairly targeted by the NBA. 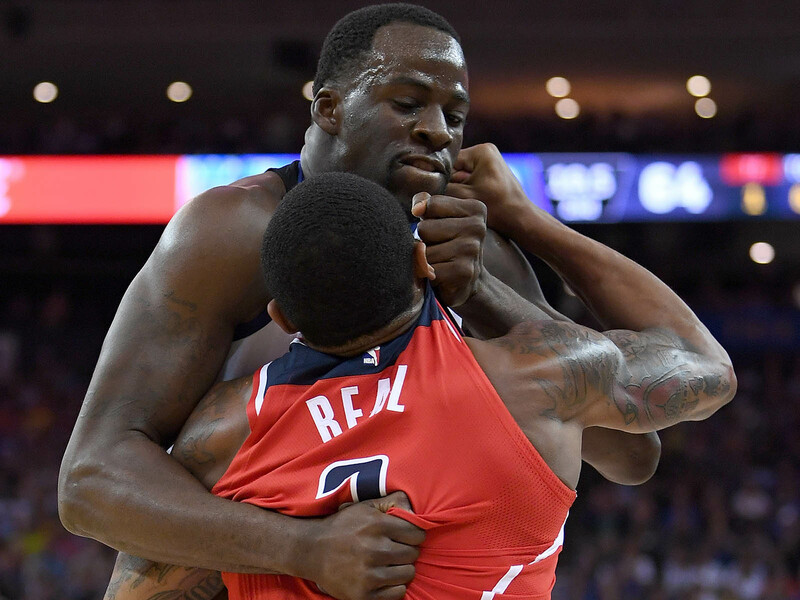 As for the Bradley Beal fight, he was fined for because it's never a coincidence when Draymond gets caught in the middle of a fight. All of which is to say, this wounded, "I guess I can't be me" monologue is just incredible. Strong line from Wolves' Tom Thibodeau: "If you’re waiting on potential, you’re waiting on losing. We can’t wait on potential any longer." Tom Thibodeau has been clear that this is the year the Wolves get serious about winning, and it's almost working. At 4-3 they are fifth in the West, right about where most people expected them to be. The problem is the games themselves. Buying into the Wolves before the season was fairly simple. Minnesota was talented enough to compete in most games last year, but they were poor on defense, laughably bad in third quarters, and they had no one to close out games in the fourth. This year the defense would get better as Towns improved from Kanter-level to league average, Jimmy Butler and Jeff Teague would help stabilize the offense to avoid lopsided third quarters, and then Butler would be the fourth–quarter closer. It made sense. But it hasn't really come together. So far it's been Andrew Wiggins closing games, not Jimmy Butler. Wiggins has taken more shots than Butler in every game they've played, and it's one of the more baffling phenomenons to emerge in the early season. Wiggins is fine, but fairly one-dimensional, and not good enough to justify that kind of investment on offense. Butler is an All-NBA player who can provide exactly the kind execution Thibs said he's looking for this season. Meanwhile, KAT's the most talented scorer on the team, but it's not clear that the team has any idea where or how to use him. The Wolves are last in defensive efficiency, and in that Heat game Jimmy Butler was 5 of 13 from the floor while Andrew Wiggins was 7 of 23. This can't be the plan, right? The Wolves should be fun, but they are currently way too stressful to qualify as enjoyable. Yes, the Cavs have enough talent to win the East this year and probably for the foreseeable future, but that's not the point. Double-digit losses to the Knicks and Pelicans were a good reminder of why LeBron might really leave regardless. It's not just that he'd want to beat Golden State, but the prospect of running it back year after year with bloated Cavs rosters could be its own call to action. Even if he can't build an obvious Warriors challenger somewhere else, does anyone really want to see LeBron stay loyal to Ohio and recreate the KG-Joe Johnson Nets through the 2020s? It's not a knock on the raw talent in Cleveland or what's possible this year, and I reserve the right to rescind this take—plus any and all Eastern Conference optimism!—within the next few months. But we know the Cavs will be ugly for a while, and eventually they'll probably be fine, and we've done all this before. That's part of the problem. This version of the Cavs is boring right now. And if the Warriors are going to rule the league for the next few years, LeBron should at least keep the story interesting.